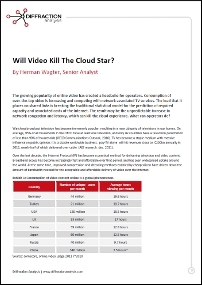 Cloud services increasingly rely on low-latency, but video traffic threatens that, at least with current statistical flow management approaches. Consumption of over-the-top video is increasing, and the load that it places on shared links is breaking the traditional statistical model for the prediction of required capacity. The result may be the unpredictable increase in network congestion and latency, which can kill the cloud experience. What can operators do? This report is written by Herman Wagter and explores the implication of online video delivery on legacy network management practices and examines potential solutions to the conundrum that the coexistence of online video-delivery and low latency requirements poses. The findings will be of particular interest to access providers facing recurring congestion issues, and regulators or policy makers looking to understand how exactly online video is changing the scene from a network perspective.